One of the groundhogs that used to live in my backyard. 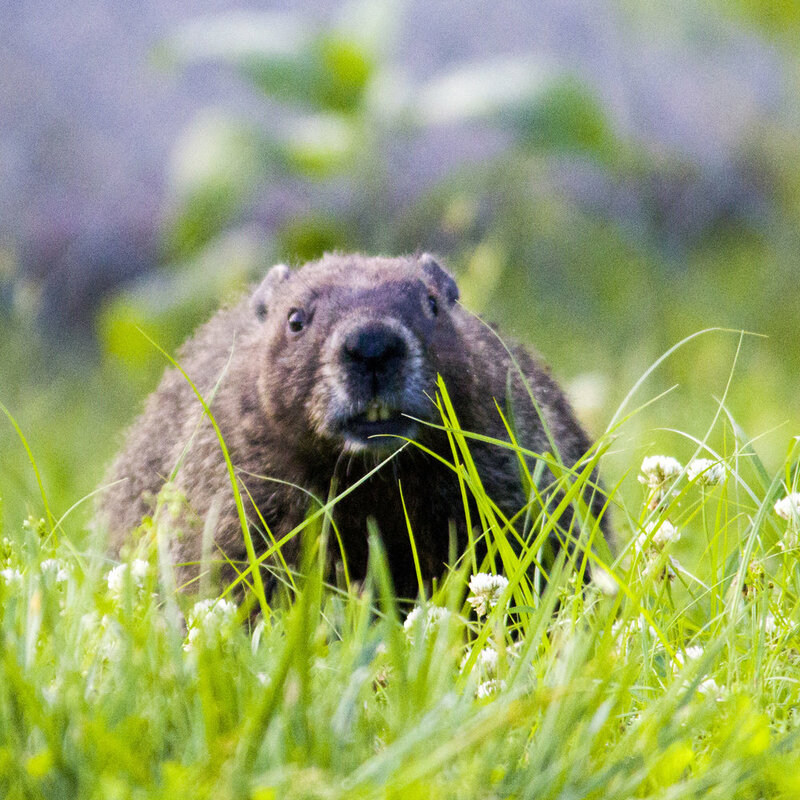 This is episode 31 of Recovering Faith, and I am calling this episode “the parable of the groundhog.” For a while I thought about calling this episode, “Here’s your sign,” for reasons that will be clear soon, but I ultimately decided to call it “the parable of the groundhog.” I hope you learn something, or enjoy it, at the very least. This spring, as soon as the weather warmed up, groundhogs decided that my back yard would great place to live. I, of course, was not excited about my new hole digging guests and did all I could to persuade them to move on, first somewhat politely, and then eventually moving on to more extreme measures. I think Groundhog day is rubbish, but I don’t have anything against groundhogs, so long as they are not on my property doing property damage. One of the first thing I did to try and get rid of the groundhogs, after using commercially available groundhog/rodent deterrents, was flood their tunnels. I learned groundhog tunnels are constructed so that the area where they live cannot be flooded so I moved on to filling in the hole they had dug under my deck, but that did not dissuade them and they dug it back out the next day. I tried to use a live trap to relocate the groundhogs, but they came back, so I tried to make my backyard seem like it was not a good place for them by putting moth crystals in their holes, but it did not phase them. Deciding I needed to resort to more extreme methods, I went to Home Depot and purchased chicken wire and concrete. I filled in the holes with concrete and put chicken wire around the base of my deck and around my shed, but these were persistent creatures and not easily dissuaded. After a few days the groundhogs had tunneled under the chicken wire and dug around the concrete. I did everything I could think of to make the groundhogs know they were not welcome and anywhere near my yard. Honestly, if my house were not surrounded by other houses I would have shot the groundhogs without a second thought, but because of the close proximity of other houses I decided that it was not safe to shoot the critters. I did, however, shoot the groundhogs with a bb gun, knowing full well that it wouldn’t even injure them, but I wanted to scare them out of my yard every time I saw them. I was getting so frazzled I was like Bill Murray in Caddyshack, but unlike his character, I did not resort to explosives. I was, however, just about ready to call some professional pest removal people. I am certain the groundhogs had absolutely no doubt that they were not welcome in my yard and that I was trying to get rid of them. I did my best to not only make sure they knew they were not welcome in my yard but that they were in grave danger if they did not immediately vacate the property and move on elsewhere. After several months of fighting with the groundhogs and making sure they knew they were not welcome and were in danger, I was at a loss as to what to do, but a solution presented itself. I have an uncle and aunt who live a few hours away who has a large dog named Ginger and they called me to ask if I could watch their dog while they went on vacation, an arrangement to which I agreed. At the time it did not occur to me that sitting a dog may be a solution to my groundhog problem, but I quickly discovered that it was. After only having Ginger for a few days I discovered just how effective she was at eliminating groundhogs because when I got home from work I found her in the back yard, chewing on a mortally wounded groundhog. A few days later another groundhog took the big dirt nap thanks to the dog. I only had Ginger for a week, but I haven’t seen any groundhogs or evidence of them since I had her here. The reason I brought up all of that about the groundhogs is because it relates well to the topic I want to discuss today, which is, in life there are often things we want to do or places we want to be where we are given clear and unmistakable signs that we should not be there and that if we don’t leave or change our behavior that there will be dire consequences. The majority of places or choices that are dangerous for us, either physically, spiritually or both, have a myriad of warning signs that we have to ignore if we are to proceed. Ignoring the signs does not make the danger go away, nor does it lessen the consequences that will inevitably follow our choices and actions. When I was younger I lived in an area that had a lot of dilapidated and condemned buildings and, despite the warnings and no trespass signs, teens would insist on breaking in to drink or do other things they should not have been doing, and I was constantly hearing about teens getting injured, sometimes seriously. Every teen who broke into one of those buildings thought that he or she would be the exception and would not get injured or arrested, but few were an exception. People often do things that they know are truly terrible ideas because their desire to do whatever it is outweighs the dangers. If we give into our desires they often consumes our minds until there is no more room for reason. Just because we convince ourselves that something is OK to do or that there is no danger, or that the danger is outweighed by the benefits, does not make it so. It doesn’t matter how we feel about something because reality does not care about our feelings. Some people claim that we all have are own realities, but the truth is, there is reality and there is our personal delusions. Reality doesn’t care about our delusions and is not effected by it even by the most minuscule of amounts. Often, when we ignore the warning signs and get ourselves into trouble, we are forced to either accept the fact that we have done wrong and accept the consequences of our actions, or else, get ourself deeper into trouble by doing something that is even more wrong to hide our original sin. A couple of good examples come to mind, one is a teen couple who gets pregnant and has an abortion to cover their indiscretion, and King David who had an affair with another man’s wife and then killed the man to try and cover it up. Of course, the entire literate world knows of King David's sins so his effort to hide his sin failed on an epic scale. In the example of the teens, even if they were not raised in a religious home, they are aware of many of the inherent dangers with being sexually active as an unmarried teen, some of which include abuse, disease, heartbreak, unintended pregnancy and a compromised financial and academic future. Some young people are so afraid of the consequences of their poor choices that they are convinced that the only out is to get an abortion, and society has led them to believe that it is a perfectly acceptable solution and is basically like hitting the “undo” button or erasing a mistake. Society teaches that an unborn child is nothing more than a clump of cells and is no more wrong to kill the child than breaking an egg or throwing away a plant seed, but plant seeds or chicken eggs do not produce humans, a sentient being with a soul. The problem is, an abortion ends the life of a child and is not as simple as just correcting a mistake. God is not pleased with abortion and that should be clear to anyone who is even remotely familiar with the Bible. I am not saying that there are no legitimate instances where abortion is not only justified but is the only logical option, because I know that those instances do occur, but I am saying that they are extremely rare, and even then, the decision to abort a pregnancy should not be rushed into. In the example of David, one poor decision led to another until David was basically destroyed, both politically and spiritually. Yes, David was forgiven for his multitude of sins, but being forgiven did nothing to eliminate or reduce the natural consequences for those sins. David's first mistake was to stay at home instead of going to battle with his army, as was the custom and tradition of the Jewish people. from the high vantage point of his palace roof, Daved saw a woman taking what she thought was a private bath. Overcome with lust, David sent his servants to fetch the woman, and even if Bathsheba had the option to say "no,” since she was propositioned by the king, she likely felt that she didn't have the power to refuse. Later, once David discovered that his immorality had led Bathsheba to become pregnant he sought to hide his sin by making Uriah, Bathsheba’s husband, think the child was his. The problem was, Uriah was an honorable man and refused to go home to his wife when his men could not go home to their families so David resorted to more extreme and sinful avenues. David chose to have Uriah murdered, though if it had been an option at the time, David would likely have arranged for Bathsheba to have an abortion instead of murdering her husband. At any rate, David knew all along the way that his actions were wrong and ignored his conscience and the warning signs he encountered. One of my biggest mistakes that I had to ignore the most warnings to make occurred When I was a bus driver. I had dropped off a group of Nebraska kids at a Bible camp in Kansas and a week later I went to pick them up. When I had originally dropped off the kids and their leaders, I took the route that the GPS told me to take, ignoring the passengers when they told me to take another route that would take a half hour or so longer. The reason the passengers did not want me to follow the GPS is because it took us down a dirt road that was questionable at best. We got to the camp ahead of schedule and I didn’t see what the big deal was. When I was on my way to pick up the kids to take them back to Omaha, Nebraska I had originally planned to take the longer route, but I got stuck in construction and was way behind, so I decided to take the shortcut. Keep in mind that the passengers were adamant that I not take the shortcut. It had rained previously, but the surface had dried and it wasn’t immediately obvious. There was a sign that read, “Road closed when wet.” Of course, I didn’t think the road was wet and ignored the sign. Once I turned onto the road I immediately knew it was wet, but decided I didn’t want to back out onto the highway and decided to proceed, after all, it was only about a quarter of a mile to the other end where I would come out on the other highway. I was literally only about fifty feet from the end of the road when the bus lost traction and was hopelessly stuck. It really doesn’t take much to get a tour bus stuck. I called the group to let them know I would be late, and I had to call my boss to ask for a tow. A few minutes later an extremely angry sheriff showed up and immediately made sure that I knew he was not happy, and then made sure I knew how much of an idiot I was. The sheriff gave me a nearly six hundred dollar fine for failure to follow posted directions, and if he wanted, he could have also charged me for the damage to the road, but I got off lucky. The sheriff told me he had half a mind to not allow the tow trucks to pull me out and make me stay until the road dried, but he said he didn’t want my kind of stupidity to stay in his county. I showed up five hours late to pick up my group, all because I wanted to save half an hour. The sheriff told me he had half a mind to not allow the tow trucks to pull me out and make me stay until the road dried, but he said he didn’t want my kind of stupidity to stay in his county. I showed up five hours late to pick up my group, all because I wanted to save half an hour. In the end, it cost me close to six hundred dollars, and after paying a few thousand dollars to get the bus towed and refunding the passengers their money, I cost the company a substantial sum of money as well. The sheriff would not let the tow trucks, it took two trucks to get the bus unstuck, to pull me the fifty feet to the other road and made me back all the way out the way I had come. After all the effort and trouble, I still had to take the longer route, the route I should have taken in the first place. When I picked up the group they were livid with me, and rightly so, and if they were not Christian, they might have killed me and driven the bus back themselves. After yelling at me for half an hour, the group didn’t say a single word to me the rest of the four hour trip back to Omaha. Needless to say, I did not get a tip, nor did I deserve or expect one. Once I got the bus back to the bus garage my supervisor informed me that he was extremely disappointed with me and he had to bend over backward to convince the company to keep me. Honestly, I was surprised that I didn’t get fired, and I completely deserved to be fired for my stupidity. I stayed with the company another four years, and I turned out to be a good investment, but they still went out on a limb by keeping me as they had no guarantee that I would make the company money and had every reason to consider me a liability. For the entirety of the next year I felt like I was walking on eggshells to keep from doing anything wrong. I made it a point to not turn down any run, regardless of how horrible I knew it would be, and I made sure not to complain about the trips or the groups. I am grateful that the company kept me, and even if they had fired me, I would not have a single bad thing to say about the company and they were one of the best companies I have ever worked for. Stupidity and not heeding danger signs always has consequences. I even had to pay higher insurance for three years because I received a ticket while driving a commercial vehicle. Whenever I think back to that decision I kick myself. I wish I could honestly say that I have not made any other stupid decisions since then, but I can’t, but I can honestly say that I have not made any decisions that even remotely approaches the magnitude of stupidity that that one did. The Bible is full of examples of people doing astonishingly stupid things, despite the fact that there were a multitude of warning signs, and sometimes even direct commandments against it by God. Consequences always followed and they always will. While we are free to choose our actions, we have no power over the consequences of those actions. It wasn’t long after the children of Israel were freed from slavery that they ignored all of the warning signs, and even commandments, and gave themselves over to idolatry, all sorts of sexual sin and lasciviousness, drunkenness, brawling, violence and a myriad of other sins. Even Aaron, the brother of Moses, got in on the action and made a golden calf, an idol for the people to worship instead of worshiping the only true God. For these and other sins, the children of Israel wondered in the wilderness for forty years, a trip that should have only taken them approximately two weeks. Adam and Eve ignored multitudes of signs, and even a direct commandment, in order to partake of the forbidden fruit after hearing a compelling pitch from the original snake oil salesman. We know all too well what Adam and Eve lost by their poor decision, and in a lot of ways, we are all paying for that decision so many years ago. Many poor decisions have ripple effect and cause harm to not just us and those we know, but reverberates for generations. Scott Smith, the pastor of the church I attend (Wellspring Church in Webb City, Mo), said, “We will never commit a sin that affects just us,” a statement to which I completely agree with. Jonah was given a direct commandment by the Lord of the universe to preach repentance to the people of Nineveh, but Jonah could not get over his pride and ignored all the signs and ran face first into danger and destruction. When the ship Jonah took passage on was about to come to a disastrous end because of Jonah’s sin the crew threw him overboard so they would not suffer his fate with him. The crew paid attention to the signs, as did the people of Nineveh once the signs were presented to them. Of course, Jonah was not happy with the fact that the Nineties had repented until God gave him an object lesson involving a leaf and a worm. Jonah camped up on the hill and waited for the Nineties to be destroyed, but when they repented and were forgiven Jonah was upset. God caused a large leaf to grow up and shade Jonah, and then he caused a worm to chew the stalk and cause the plant to wither and die. Jonah was upset about the loss of the plant, so God pointed out to him that he was upset about the loss of a plant that he did not plant or do any work to obtain, yet he was upset with God for saving a group of people that he had a lot invested in. Despite the fact that he had to know it was an absolutely terrible idea, Abraham let another man think Sarah, his wife, was his sister and walk off with her, not once but twice (Genesis 12 and 20). Both times the man who had no idea Sarah was married was angry with Abraham because his fear almost caused the men to sin a great sin in the eyes of God, and they knew that they would suffer as a result. I know people who have lost everything because they decided it was worth the risk to indulge in inappropriate sexual behavior with a person who was not his or her spouse. I know other people who didn’t loose everything after an affair, but their relationship was damaged and their spouse will never trust them to the level they did before the affair. Anyone with any common sense would admit that whatever they got out of the affair was not even remotely worth giving up what they lost. Whenever we enter into a trade with the devil it is always a one sided trade where he gets what he wanted and we are left with guilt, shame, broken relationships, lost jobs and diminished health. I think it is fair to say the devil will never enter into an agreement where he stands to loose anything, but then again, the devil has already lost everything and has nothing left to loose. we, however, stand to loose everything. Unlike the devil, God is always upfront with us and lays out the terms and conditions in bold, over sized print. If we follow God we know what we are gaining, and if we don’t follow God we know what we are forfeiting. God has never and will never trick anyone. Anytime there is a warning associated with something, the warning is there for a reason, and if we don’t heed the warnings we can wind up like the groundhogs in my backyard, and worse, we can wind up in hell. some people like the aspect of danger and want to get as close to the edge as they can, and with extreme sports the only thing they stand to loose is their life, but when it is matters of spirituality we stand to loose a great deal more. A while back I watched a spoof movie with my older sister that was designed to make fun of horror movies, and in one scene the blond who was running from the killer came to an intersection with two signs, and the girl looked at both signs before proceeding. One sign read, “Safety” and the other read, “Painful and gruesome death,” and of course, the blond ran into the unsafe direction. The killer watched the entire thing and did a face palm as an exclamation of the victims stupidity. Sometimes the signs are just as clear in life, and we still make the wrong decision. I can understand why people who are hooked on drugs continue to struggle with the addiction, as a drug addiction is extremely difficult to kick, but what I can’t understand is why they started in the first place. In today’s day and age, you would have to be living under a rock to not know the horrible things drugs can do to your life and your family, even if you don’t consider incarceration in the scenario. No one can do heavy drugs and honestly say they did not know that the drugs were bad for them. Even people who are raised without religion know basically what is right and what is wrong because they have a conscience, which was put there by God. In the Bible God says, “I will put my law in their minds and write it on their hearts,” (Jeremiah 31:33 NIV). Everyone is born with the ability to know right from wrong, but when they get away from God they rationalize why they should be allowed to do things against their conscience, and the voice of their conscience gets quieter and quieter until one day they can’t hear it at all. Even people who are in cults see the signs that the group that they are in is not what it was advertised as, but they ignore the signs and red flags because of fear, social pressure within the group, and because they have been brainwashed by the leaders to think that all red flags or doubts are caused by lies by those on the outside who want to destroy them. People who have left cults often talk of all the warning signs and red flags they ignored and the mental gymnastics they had to engage in to do so, or as George Orwell described it in his iconic book 1984, “Doublethink,” which is to hold two or more contradictory ideas at the same time and completely believe both. Some people think of the Bible only as a source of comfort and wisdom, but it could also be viewed as a safety manual. By following the word of God we will be safer both physically and spiritually, and the worst thing imaginable is not anything that can happen in this life, but that when we die and are judged we go to hell because we chose not to follow God. God is not just a stern father figure who is eager to judge us for every wrong; God loves us more than we can ever imagine and that is why he sent his son, Jesus, to die on our behalf. No greater love has ever or can ever exist than what God has for us. Thanks for listening/reading. Don’t be like the groundhogs in my yard, pay attention to the signs and listen to the advise of the God who loves us more than we will ever know.